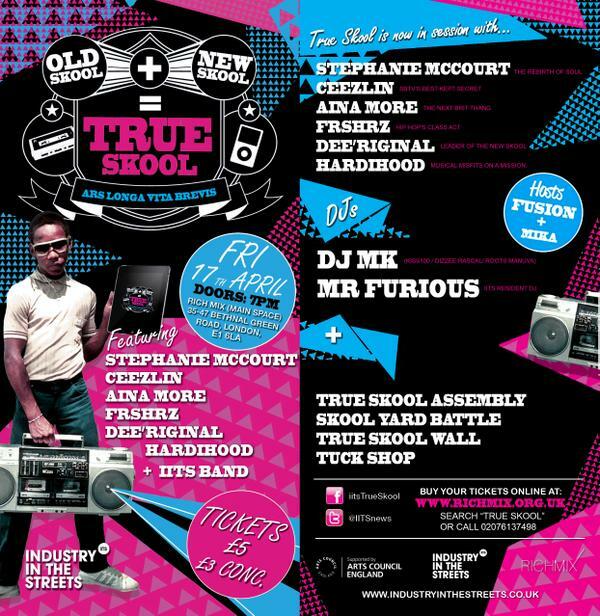 Home / Featured Posts / DJ MK, STEPHANIE MCCOURT, AINA MORE, CEEZLIN & GUESTS JOIN THE TRUE SKOOL CREW FOR A CROWDSHOOT SPECIAL. The True Skool movement just gets bigger and better. Our DigiJam night took soundclashing into the 21st century; then we dropped Take A Break for fans of the grooves that inspired hip hop’s golden era. If ‘Three Is The Magic Number’ then the last part in our True Skool trilogy is set to be something special. We return to Rich Mix on Friday, 17th April with a night that celebrates the best of the old skool, while showcasing the finest new skool talent. True Skool has teamed up with digital mavericks Trybe TV to turn our audience into a camera crew. We plan to broadcast a groundbreaking multi-cam musical experience to the world… and we’re offering YOU front row seats. Grab your ticket now and catch our awesome line up of game changers in action. • Stephanie McCourt – Meet an award-winning vocalist whose fresh take on classic soul embodies the spirit of True Skool. • Ceezlin – Brighton’s versatile verbalist shows us why he’s SBTV’s best-kept secret. • Aina More – Find out why this poet, rapper and show-stopper is getting nods from Professor Green, BRIT School and Capital FM. • FRSHRZ – Class is truly in session when veteran rhymers Artcha, Skandouz & Dray Delta are in the building. • DeeRiginal – This charismatic South London lyricist is a true leader of the new skool packing effortless flows and witty wordplay. • Hardihood – Meet the musical misfits on a mission to blur the boundaries between live and digital music. The IITS Band will be bringing the vibes on stage while party starters MK and Mr Furious get busy in the mix. Add street art courtesy of IITS resident visualiser Robe, a Skool Yard ‘Open Mic’ Battle, the True Skool Tuck Shop and a True Skool Wall paying homage to homegrown heroes from Sade to So Solid, and you’re set for an event that redefines ‘fresh’.